Cheers francois, good to see the old crew are still here making porteus great. Ill be poking my head in when I get the chance, Ive been having tonnes of fun playing around with porteus again. @ brokenman. I cant seem to find a log of the actual boot text. Searching the internet is not providing much help on the subject. Is it possible there is no log for this? The easiest way would be to set up a virtualbox and in the settings throttle the cpu to about 7% to get a real slow boot and see the message. Other than that the messages may be divided into different places in /var/log. What uses/controls the files in /home/guest/.cache/thumbnails/normal? I have files in it going back to Aug 5!! I was thinking Firefox but it has it's own at /home/guest/.cache/mozilla/firefox/dxsqumip.default/cache2/entries. alexgorr wrote: I'm sorry asking that , but are there some updates to download or there will be be a rc6 ? Space is a separator, so in fact trying to activate 2 things. The first does not end in xzm, resulting in the error message you got. Renaming to some_thing.xzm should avoid the issue. I suspect these would also. Anyone else having connectivity problems please let me know. Bogomips can you please point me again to a rar file that doesn't decompress using unrar? Thanks. Refreshed the save.dat file and starting over. Initially booting with the new save.dat file the clock shows the correct time, which is the same time shown on my other booted systems. If I change the 3.2rc5 system to the correct time zone and adjust the clock back to the right time the other systems when booted are then off by 4 hrs!! The only way all systems display the correct time is when 3.2rc5 Cinnamon 64-bit keeps the original time zone which I assume is the UTC one. Basically it is changing the pc's system clock rather than just displaying the time as set. Are you in a zone that recently moved to daylight saving time? Porteus doesn't write to the system clock so as not to upset other OSs' times. The first syncs the clock to network time. The second writes to the internal clock. Brokenman, I am hoping that I can report this as a bug (and obtain some specific references w/o a lot of research). When I boot Porteus on my Kangaroo, the first messages I see after vmlinuz loads are a dozen or more saying "Failed to alloc mem for rom". 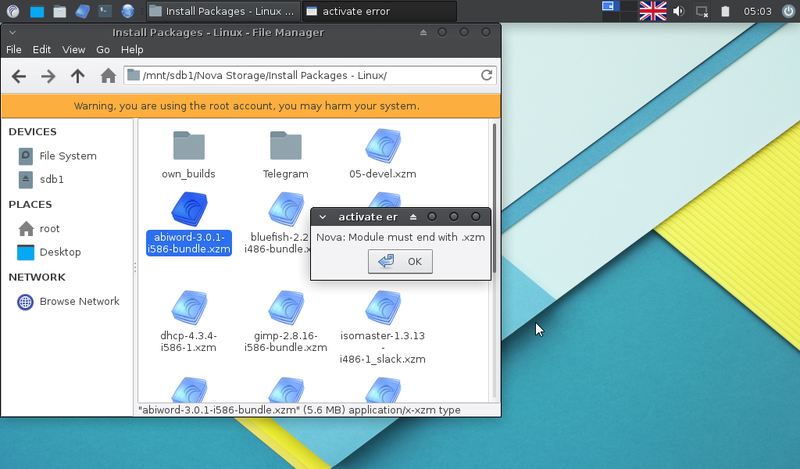 The OS is now working beautifully; I have XFCE configured the way I like it -- with Vertex Dark theme and Faenza Dark icons (so the many warnings about not allocating memory do not seem to indicate any real problem), but I would like to know: a) what is causing that particular warning and how to resolve it, b) how to capture (and analyze) all boot/shutdown messages (in order to resolve any warning conditions I can), and c) how to suppress text output during boot/shutdown (if possible -- could a new cheat code be included to accomplish this?). Any insights appreciated. Shall I publish this? If I do, I should provide a link to 3.2 rc5 downloads (with functioning Network Manager); are there .isos including the working Network Manager up? P.P.S. I think I've run out of bugs; love Porteus! brokenman wrote: Are you in a zone that recently moved to daylight saving time? All I know is when I started the clocks were correct on 3 operating systems; Windows, Porteus 3.0.1 and Porteus 3.2rc5 Cinnamon. When I changed the Region/City to America/Toronto in 3.2rc5 Cinnamon I then had to change the hours to the current time in 3.2rc5. There after when I rebooted the other OSs their clocks were wrong, by either 4, or 5, hrs each. I don't know what Porteus 3.2 was writing to but it effected the clocks on 2 other systems on my netbook. OK, thanks. By network you are referring to my in home network? What about the time zone? If "Porteus doesn't write to the system clock" how does the 2nd command work? So I reboot 3.2rc5 Cinnamon to verify the hour change, the clock is correct, I unlock the Settings, I change the Region/City from Europe/London to America/Toronto and the clock doesn't change!! I wait a minute, no change. I lock the Settings and reboot. I boot to Windows, the clock is ok. I reboot to 3.2rc5 Cinnamon, I check the clock Settings, Region/City are back to Europe/London. And yes I am sure the save.dat file was updated when I rebooted.